1 A None No Power Seat 1 A is a World Business Class Bulkhead seat. This seat is more private than others on the plane, as it is at the front of the cabin. 1 J None No Power Seat 1 J is a World Business Class Bulkhead seat. This seat is more private than others on the plane, as it is at the front of the cabin. 1 K None No Power Seat 1 K is a World Business Class Bulkhead seat. This seat is more private than others on the plane, as it is at the front of the cabin. 10 B None No Power Seat 10 B is a standard Economy Comfort seat. 11 D None No Power Seat 11 D is an Economy Comfort seat where the close proximity to the lavatory may be bothersome. The tray table is in the armrest, making the armrest immovable and slightly reducing seat width. There may be no floor storage during take-off and landing. 11 E None No Power Seat 11 E is an Economy Comfort seat where the close proximity to the lavatory may be bothersome. 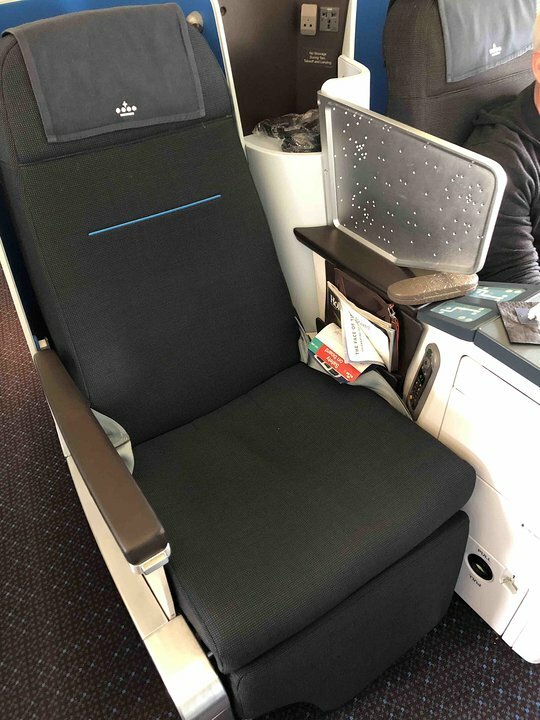 There is also a cabinet that has been placed in front of this seat, causing the legroom to be restricted, despite paying extra for an Economy Comfort seat. The tray tables are in the armrests, making the armrests immovable and slightly reducing seat width. There may be no floor storage during take-off and landing. 12 D None No Power Seat 12 D is a standard Economy Comfort seat. This seat is one of the only coupled seats in Economy Class and is ideal for those traveling with a companion. 12 E None No Power Seat 12 E is a standard Economy Comfort seat. This seat is one of the only coupled seats in Economy Class and is ideal for those traveling with a companion. There is extra space between this seat and the wall, which provides extra storage. However if you like to lean against the wall to sleep, you may be uncomfortable. 14 D None No Power Seat 14 D is a standard Economy Comfort seat. This seat is one of the only coupled seats in Economy Class and is ideal for those traveling with a companion. 14 E None No Power Seat 14 E is a standard Economy Comfort seat. This seat is one of the only coupled seats in Economy Class and is ideal for those traveling with a companion. There is extra space between this seat and the wall, which provides extra storage. However if you like to lean against the wall to sleep, you may be uncomfortable. 15 D None No Power Seat 15 D is a standard Economy Comfort seat. This seat is one of the only coupled seats in Economy Class and is ideal for those traveling with a companion. 15 E None No Power Seat 15 E is a standard Economy Comfort seat. This seat is one of the only coupled seats in Economy Class and is ideal for those traveling with a companion. There is extra space between this seat and the wall, which provides extra storage. However if you like to lean against the wall to sleep, you may be uncomfortable. 16 A None No Power Seat 16 A is a standard Economy Comfort seat. 16 B None No Power Seat 16 B is a standard Economy Comfort seat. 16 C None No Power Seat 16 C is a standard Economy Comfort seat. 16 D None No Power Seat 16 D is a standard Economy Comfort seat. This seat is one of the only coupled seats in Economy Class and is ideal for those traveling with a companion. 16 E None No Power Seat 16 E is a standard Economy Comfort seat. This seat is one of the only coupled seats in Economy Class and is ideal for those traveling with a companion. There is extra space between this seat and the wall, which provides extra storage. However if you like to lean against the wall to sleep, you may be uncomfortable. 17 A None No Power Seat 17 A is an Economy Comfort seat in the last row of the section that may have limited recline. The close proximity to the lavatory and galleys may be bothersome. 17 B None No Power Seat 17 B is an Economy Comfort seat in the last row of the section that may have limited recline. The close proximity to the lavatory and galleys may be bothersome. 17 C None No Power Seat 17 C is an Economy Comfort seat in the last row of the section that may have limited recline. The close proximity to the lavatory and galleys may be bothersome. 17 D None No Power Seat 17 D is an Economy Comfort seat in the last row of the section that may have limited recline. The close proximity to the lavatory and galleys may be bothersome. 17 E None No Power Seat 17 E is an Economy Comfort seat in the last row of the section that may have limited recline. The close proximity to the lavatory and galleys may be bothersome. There is extra space between this seat and the wall, which provides extra storage. However if you like to lean against the wall to sleep, you may be uncomfortable. 2 K None No Power Seat 2 K is a standard World Business Class seat. 21 A None No Power Seat 21 A is an Economy Class Exit Row seat where the Exit Door protrudes into your legroom. The close proximity to the lavatories and galleys may be bothersome. The tray table is in the armrest, making the armrest immovable and slightly reducing seat width. There may be no floor storage during take-off and landing. 21 B None No Power Seat 21 B is an Economy Class seat that KLM designates as a Preferred seat, and you must pay an additional fee to sit here. This seat has extra legroom due to the Exit Row. The proximity of the lavatories and galleys may be bothersome. The tray tables are in the armrests, making the armrests immovable and slightly reducing seat width. There may be no floor storage during take-off and landing. 21 C None No Power Seat 21 C is an Economy Class seat that KLM designates as a Preferred seat, and you must pay an additional fee to sit here. This seat has extra legroom due to the Exit Row. The proximity of the lavatories and galleys may be bothersome. The tray tables are in the armrests, making the armrests immovable and slightly reducing seat width. There may be no floor storage during take-off and landing. 21 H None No Power Seat 21 H is an Economy Class seat that KLM designates as a Preferred seat, and you must pay an additional fee to sit here. This seat has extra legroom due to the Exit Row. The proximity of the lavatories and galleys may be bothersome. The tray tables are in the armrests, making the armrests immovable and slightly reducing seat width. There may be no floor storage during take-off and landing. 21 J None No Power Seat 21 J is an Economy Class seat that KLM designates as a Preferred seat, and you must pay an additional fee to sit here. This seat has extra legroom due to the Exit Row. The proximity of the lavatories and galleys may be bothersome. The tray tables are in the armrests, making the armrests immovable and slightly reducing seat width. There may be no floor storage during take-off and landing. 21 K None No Power Seat 21 K is an Economy Class Exit Row seat where the Exit Door protrudes into your legroom. The close proximity to the lavatories and galleys may be bothersome. The tray table is in the armrest, making the armrest immovable and slightly reducing seat width. There may be no floor storage during take-off and landing. 24 C None No Power Seat 24 C is an Economy Class seat where the close proximity to the galleys may be bothersome. 24 H None No Power Seat 24 H is an Economy Class seat where the close proximity to the galleys may be bothersome. 25 C None No Power Seat 25 C is an Economy Class seat where the close proximity to the galleys may be bothersome. 25 H None No Power Seat 25 H is an Economy Class seat where the close proximity to the galleys may be bothersome. 26 C None No Power Seat 26 C is an Economy Class seat where the close proximity to the galleys may be bothersome. 26 H None No Power Seat 26 H is an Economy Class seat where the close proximity to the galleys may be bothersome. 27 C None No Power Seat 27 C is an Economy Class seat where the close proximity to the galleys may be bothersome. 27 H None No Power Seat 27 H is an Economy Class seat where the close proximity to the galleys may be bothersome. 28 C None No Power Seat 28 C is an Economy Class seat where the close proximity to the galleys may be bothersome. 28 D None No Power Seat 28 D is an Economy Class Bulkhead seat that has restricted legroom due to the proximity of the Bulkhead. The tray tables are in the armrests, making the armrests immovable and slightly reducing seat width. There may be no floor storage during take-off and landing. 28 E None No Power Seat 28 E is an Economy Class Bulkhead seat that has restricted legroom due to the proximity of the Bulkhead. The tray tables are in the armrests, making the armrests immovable and slightly reducing seat width. There may be no floor storage during take-off and landing. 28 F None No Power Seat 28 F is an Economy Class Bulkhead seat that has restricted legroom due to the proximity of the Bulkhead. The tray tables are in the armrests, making the armrests immovable and slightly reducing seat width. There may be no floor storage during take-off and landing. 28 G None No Power Seat 28 G is an Economy Class Bulkhead seat that has restricted legroom due to the proximity of the Bulkhead. The tray tables are in the armrests, making the armrests immovable and slightly reducing seat width. There may be no floor storage during take-off and landing. 28 H None No Power Seat 28 H is an Economy Class seat where the close proximity to the galleys may be bothersome. 29 A None No Power Seat 29 A is an Economy Class seat that may have a misaligned window. 29 K None No Power Seat 29 K is an Economy Class seat that may have a misaligned window. 3 K None No Power Seat 3 K is a standard World Business Class seat. 30 A None No Power Seat 30 A is an Economy Class seat that may have a misaligned window. 30 K None No Power Seat 30 K is an Economy Class seat that may have a misaligned window. 31 A None No Power Seat 31 A is an Economy Class seat that may have a misaligned window. 31 K None No Power Seat 31 K is an Economy Class seat that may have a misaligned window. 33 A None No Power Seat 33 A is an Economy Class seat that may have limited recline. The close proximity to the lavatory may be bothersome. 33 B None No Power Seat 33 B is an Economy Class seat that may have limited recline. The close proximity to the lavatory may be bothersome. 33 C None No Power Seat 33 C is an Economy Class seat that may have limited recline. The close proximity to the lavatory may be bothersome. 33 D None No Power Seat 33 D is an Economy Class seat that may have limited recline. The close proximity to the lavatory may be bothersome. 33 E None No Power Seat 33 E is an Economy Class seat that may have limited recline. The close proximity to the lavatory may be bothersome. 33 F None No Power Seat 33 F is an Economy Class seat that may have limited recline. The close proximity to the lavatory may be bothersome. 33 G None No Power Seat 33 G is an Economy Class seat that may have limited recline. The close proximity to the lavatory may be bothersome. 33 H None No Power Seat 33 H is an Economy Class seat that may have limited recline. The close proximity to the lavatory may be bothersome. 33 J None No Power Seat 33 J is an Economy Class seat that may have limited recline. The close proximity to the lavatory may be bothersome. 33 K None No Power Seat 33 K is an Economy Class seat that may have limited recline. The close proximity to the lavatory may be bothersome. 35 A None No Power Seat 35 A is an Economy Class Exit Row seat that has limited legroom as the Exit Door protrudes into your area. This seat is missing a window. It can get very cold by the exit during flight. The tray table is in the armrest, making the armrest immovable and slightly reducing seat width. There may be no floor storage during take-off and landing. 35 B None No Power Seat 35 B is an Economy Class Exit Row seat that KLM designates as a Preferred seat, and passengers must pay an additional fee to sit here. This seat has extra legroom, but the close proximity to the lavatories may be bothersome. It can be very cold by the exits during flight. The tray tables are in the armrests, making the armrests immovable and slightly reducing seat width. There may be no floor storage during take-off and landing. 35 C None No Power Seat 35 C is an Economy Class Exit Row seat that KLM designates as a Preferred seat, and passengers must pay an additional fee to sit here. This seat has extra legroom, but the close proximity to the lavatories may be bothersome. It can be very cold by the exits during flight. The tray tables are in the armrests, making the armrests immovable and slightly reducing seat width. There may be no floor storage during take-off and landing. 35 H None No Power Seat 35 H is an Economy Class Exit Row seat that KLM designates as a Preferred seat, and passengers must pay an additional fee to sit here. This seat has extra legroom, but the close proximity to the lavatories may be bothersome. It can be very cold by the exits during flight. The tray tables are in the armrests, making the armrests immovable and slightly reducing seat width. There may be no floor storage during take-off and landing. 35 J None No Power Seat 35 J is an Economy Class Exit Row seat that KLM designates as a Preferred seat, and passengers must pay an additional fee to sit here. This seat has extra legroom, but the close proximity to the lavatories may be bothersome. It can be very cold by the exits during flight. The tray tables are in the armrests, making the armrests immovable and slightly reducing seat width. There may be no floor storage during take-off and landing. 35 K None No Power Seat 35 K is an Economy Class Exit Row seat that has limited legroom as the Exit Door protrudes into your area. This seat is missing a window. It can get very cold by the exit during flight. The tray table is in the armrest, making the armrest immovable and slightly reducing seat width. There may be no floor storage during take-off and landing. 36 B None No Power Seat 36 B is an Economy Class seat where the close proximity to the lavatory may be bothersome. 36 C None No Power Seat 36 C is an Economy Class seat where the close proximity to the lavatory may be bothersome. 36 H None No Power Seat 36 H is an Economy Class seat where the close proximity to the lavatory may be bothersome. 36 J None No Power Seat 36 J is an Economy Class seat where the close proximity to the lavatory may be bothersome. 37 D None No Power Seat 37 D is an Economy Class Bulkhead seat that has restricted legroom due to the Bulkhead wall. The close proximity to the lavatory may be bothersome. Passengers traveling with infants are often seated here as there is a bassinet located in this row. 37 E None No Power Seat 37 E is an Economy Class Bulkhead seat that has restricted legroom due to the Bulkhead wall. The close proximity to the lavatory may be bothersome. Passengers traveling with infants are often seated here as there is a bassinet located in this row. 37 F None No Power Seat 37 F is an Economy Class Bulkhead seat that has restricted legroom due to the Bulkhead wall. The close proximity to the lavatory may be bothersome. Passengers traveling with infants are often seated here as there is a bassinet located in this row. 37 G None No Power Seat 37 G is an Economy Class Bulkhead seat that has restricted legroom due to the Bulkhead wall. The close proximity to the lavatory may be bothersome. Passengers traveling with infants are often seated here as there is a bassinet located in this row. 4 A None No Power Seat 4 A is a World Business Class seat that is one of the only single seats available in Business. It has extra personal space and feels a bit more private and has direct aisle access. 4 E None No Power Seat 4 E is a World Business Class seat that is a single seat with direct aisle access, however being in the middle of the cabin it is in the flow of traffic and the proximity to the lavatory and galleys behind may be bothersome. 4 K None No Power Seat 4 K is a standard World Business Class seat. 44 D None No Power Seat 44 D is an Economy Class seat with limited recline. The close proximity to the galley may be bothersome. 44 E None No Power Seat 44 E is an Economy Class seat with limited recline. The close proximity to the galley may be bothersome. 44 F None No Power Seat 44 F is an Economy Class seat with limited recline. The close proximity to the galley may be bothersome. 44 G None No Power Seat 44 G is an Economy Class seat with limited recline. The close proximity to the galley may be bothersome. 44 H None No Power Seat 44 H is an Economy Class seat with limited recline. The close proximity to the galley may be bothersome. 44 J None No Power Seat 44 J is an Economy Class seat with limited recline. The close proximity to the galley may be bothersome. 44 K None No Power Seat 44 K is an Economy Class seat with limited recline. The close proximity to the galley may be bothersome. 45 A None No Power Seat 45 A is an Economy Class seat with limited recline. The close proximity to the galley may be bothersome. 45 B None No Power Seat 45 B is an Economy Class seat with limited recline. The close proximity to the galley may be bothersome. 45 C None No Power Seat 45 C is an Economy Class seat with limited recline. The close proximity to the galley may be bothersome. 51 A None No Power Seat 51 A is an Economy Class Exit Row seat where the Exit Door protrudes into your legroom. The close proximity to the galleys may be bothersome. The tray table is in the armrest, making the armrest immovable and slightly reducing seat width. There may be no floor storage during take-off and landing. 51 B None No Power Seat 51 B is an Economy Class seat that KLM designates as a Preferred seat, and you must pay an additional fee to sit here. This seat has extra legroom due to the Exit Row. The proximity to the galleys may be bothersome. The tray tables are in the armrests, making the armrests immovable and slightly reducing seat width. There may be no floor storage during take-off and landing. 51 C None No Power Seat 51 C is an Economy Class seat that KLM designates as a Preferred seat, and you must pay an additional fee to sit here. This seat has extra legroom due to the Exit Row. The proximity to the galleys may be bothersome. The tray tables are in the armrests, making the armrests immovable and slightly reducing seat width. There may be no floor storage during take-off and landing. 51 H None No Power Seat 51 H is an Economy Class seat that KLM designates as a Preferred seat, and you must pay an additional fee to sit here. This seat has extra legroom due to the Exit Row. The proximity to the galleys may be bothersome. The tray tables are in the armrests, making the armrests immovable and slightly reducing seat width. There may be no floor storage during take-off and landing. 51 J None No Power Seat 51 J is an Economy Class seat that KLM designates as a Preferred seat, and you must pay an additional fee to sit here. This seat has extra legroom due to the Exit Row. The proximity to the galleys may be bothersome. The tray tables are in the armrests, making the armrests immovable and slightly reducing seat width. There may be no floor storage during take-off and landing. 51 K None No Power Seat 51 K is an Economy Class Exit Row seat where the Exit Door protrudes into your legroom. The close proximity to the galleys may be bothersome. The tray table is in the armrest, making the armrest immovable and slightly reducing seat width. There may be no floor storage during take-off and landing. 52 C None No Power Seat 52 C is an Economy Class seat where the close proximity to the galleys may be bothersome. 52 H None No Power Seat 52 H is an Economy Class seat where the close proximity to the galleys may be bothersome. 53 C None No Power Seat 53 C is an Economy Class seat where the close proximity to the galleys may be bothersome. 53 H None No Power Seat 53 H is an Economy Class seat where the close proximity to the galleys may be bothersome. 54 C None No Power Seat 54 C is an Economy Class seat where the close proximity to the galleys may be bothersome. 54 H None No Power Seat 54 H is an Economy Class seat where the close proximity to the galleys may be bothersome. 56 D None No Power Seat 56 D is an Economy Class Bulkhead seat that has restricted legroom due to the Bulkhead. The close proximity to the galley may be bothersome. The tray tables are in the armrests, making the armrests immovable and slightly reducing seat width. There may be no floor storage during take-off and landing. 56 E None No Power Seat 56 E is an Economy Class Bulkhead seat that has restricted legroom due to the Bulkhead. The close proximity to the galley may be bothersome. The tray tables are in the armrests, making the armrests immovable and slightly reducing seat width. There may be no floor storage during take-off and landing. 56 F None No Power Seat 56 F is an Economy Class Bulkhead seat that has restricted legroom due to the Bulkhead. The close proximity to the galley may be bothersome. The tray tables are in the armrests, making the armrests immovable and slightly reducing seat width. There may be no floor storage during take-off and landing. 56 G None No Power Seat 56 G is an Economy Class Bulkhead seat that has restricted legroom due to the Bulkhead. The close proximity to the galley may be bothersome. The tray tables are in the armrests, making the armrests immovable and slightly reducing seat width. There may be no floor storage during take-off and landing. 62 A None No Power Seat 62 A is an Economy Class seat that may feel a bit cramped due to the curvature at the tail of the plane. 62 K None No Power Seat 62 K is an Economy Class seat that may feel a bit cramped due to the curvature at the tail of the plane. 63 B None No Power Seat 63 B is an Economy Class seat that is ideal for those passengers traveling with a companion as it is one of the only coupled seats on this plane. This seat has extra space between the seat and the wall which is great for storing things, but may be bothersome if you like to lean your head against the wall. 63 C None No Power Seat 63 C is an Economy Class seat that is ideal for those passengers traveling with a companion as it is one of the only coupled seats on this plane. 63 H None No Power Seat 63 H is an Economy Class seat that is ideal for those passengers traveling with a companion as it is one of the only coupled seats on this plane. 63 J None No Power Seat 63 J is an Economy Class seat that is ideal for those passengers traveling with a companion as it is one of the only coupled seats on this plane. This seat has extra space between the seat and the wall which is great for storing things, but may be bothersome if you like to lean your head against the wall. 64 B None No Power Seat 64 B is an Economy Class seat that is ideal for those passengers traveling with a companion as it is one of the only coupled seats on this plane. This seat has extra space between the seat and the wall which is great for storing things, but may be bothersome if you like to lean your head against the wall. 64 C None No Power Seat 64 C is an Economy Class seat that is ideal for those passengers traveling with a companion as it is one of the only coupled seats on this plane. 64 H None No Power Seat 64 H is an Economy Class seat that is ideal for those passengers traveling with a companion as it is one of the only coupled seats on this plane. 64 J None No Power Seat 64 J is an Economy Class seat that is ideal for those passengers traveling with a companion as it is one of the only coupled seats on this plane. This seat has extra space between the seat and the wall which is great for storing things, but may be bothersome if you like to lean your head against the wall. 65 B None No Power Seat 65 B is an Economy Class seat that is ideal for those passengers traveling with a companion as it is one of the only coupled seats on this plane. This seat has extra space between the seat and the wall which is great for storing things, but may be bothersome if you like to lean your head against the wall. 65 C None No Power Seat 65 C is an Economy Class seat that is ideal for those passengers traveling with a companion as it is one of the only coupled seats on this plane. 65 H None No Power Seat 65 H is an Economy Class seat that is ideal for those passengers traveling with a companion as it is one of the only coupled seats on this plane. 65 J None No Power Seat 65 J is an Economy Class seat that is ideal for those passengers traveling with a companion as it is one of the only coupled seats on this plane. This seat has extra space between the seat and the wall which is great for storing things, but may be bothersome if you like to lean your head against the wall. 66 B None No Power Seat 66 B is an Economy Class seat in the last row of the plane. This seat may have limited or no recline and the close proximity to the lavatories may be bothersome. 66 C None No Power Seat 66 C is an Economy Class seat in the last row of the plane. This seat may have limited or no recline and the close proximity to the lavatories may be bothersome. 66 H None No Power Seat 66 H is an Economy Class seat in the last row of the plane. This seat may have limited or no recline and the close proximity to the lavatories may be bothersome. 66 J None No Power Seat 66 J is an Economy Class seat in the last row of the plane. This seat may have limited or no recline and the close proximity to the lavatories may be bothersome. 67 D None No Power Seat 67 D is an Economy Class seat where the close proximity to the lavatories may be bothersome. 67 G None No Power Seat 67 G is an Economy Class seat where the close proximity to the lavatories may be bothersome. 68 D None No Power Seat 68 D is an Economy Class seat in the last row of the plane. This seat may have limited or no recline and the close proximity to the lavatories may be bothersome. 68 E None No Power Seat 68 E is an Economy Class seat in the last row of the plane. This seat may have limited or no recline and the close proximity to the lavatories may be bothersome. 68 F None No Power Seat 68 F is an Economy Class seat in the last row of the plane. This seat may have limited or no recline and the close proximity to the lavatories may be bothersome. 68 G None No Power Seat 68 G is an Economy Class seat in the last row of the plane. This seat may have limited or no recline and the close proximity to the lavatories may be bothersome. 71 J None No Power Seat 71 J is a World Business Class Bulkhead seat where the close proximity to the lavatory may be bothersome. 71 K None No Power Seat 71 K is a World Business Class Bulkhead seat. 72 A None No Power Seat 72 A is a World Business Class Bulkhead seat. 72 B None No Power Seat 72 B is a World Business Class Bulkhead seat. 72 J None No Power Seat 72 J is a standard World Business Class seat. 72 K None No Power Seat 72 K is a standard World Business Class seat. 73 A None No Power Seat 73 A is a standard World Business Class seat. 73 B None No Power Seat 73 B is a standard World Business Class seat. 73 J None No Power Seat 73 J is a standard World Business Class seat. 73 K None No Power Seat 73 K is a standard World Business Class seat. 77 A None No Power Seat 77 A is a World Business Class Exit Row seat. 77 B None No Power Seat 77 B is a World Business Class Exit Row seat. 77 J None No Power Seat 77 J is a World Business Class Exit Row seat. 77 K None No Power Seat 77 K is a World Business Class Exit Row seat. 78 A None No Power Seat 78 A is a standard World Business Class seat. 78 B None No Power Seat 78 B is a standard World Business Class seat. 78 J None No Power Seat 78 J is a standard World Business Class seat. 78 K None No Power Seat 78 K is a standard World Business Class seat. 79 J None No Power Seat 79 J is a World Business Class seat where the close proximity to the stairs and the galley may be bothersome. 79 K None No Power Seat 79 K is a standard World Business Class seat. 9 A None No Power Seat 9 A is an Economy Comfort seat that has extra legroom due to the Exit Row, however this legroom is impeded by the protruding exit door. It is often very cold near the exits. This seat is also located in a high traffic area of the aircraft and the close proximity to the lavatory and galleys may be bothersome. The tray table is in the armrest, making the armrest immovable and slightly reducing seat width. There may be no floor storage during take-off and landing. 9 B None No Power Seat 9 B is an Economy Comfort seat that has extra legroom due to the Exit Row. It is often very cold near the exits. This seat is also located in a high traffic area of the aircraft and the close proximity to the lavatory and galleys may be bothersome. The tray table is in the armrest, making the armrest immovable and slightly reducing seat width. There may be no floor storage during take-off and landing. 9 C None No Power Seat 9 C is an Economy Comfort seat that has extra legroom due to the Exit Row. It is often very cold near the exits. This seat is also located in a high traffic area of the aircraft and the close proximity to the lavatory and galleys may be bothersome. The tray table is in the armrest, making the armrest immovable and slightly reducing seat width. There may be no floor storage during take-off and landing. All World Business class seats are equipped with AC power ports. There is no power in Economy. 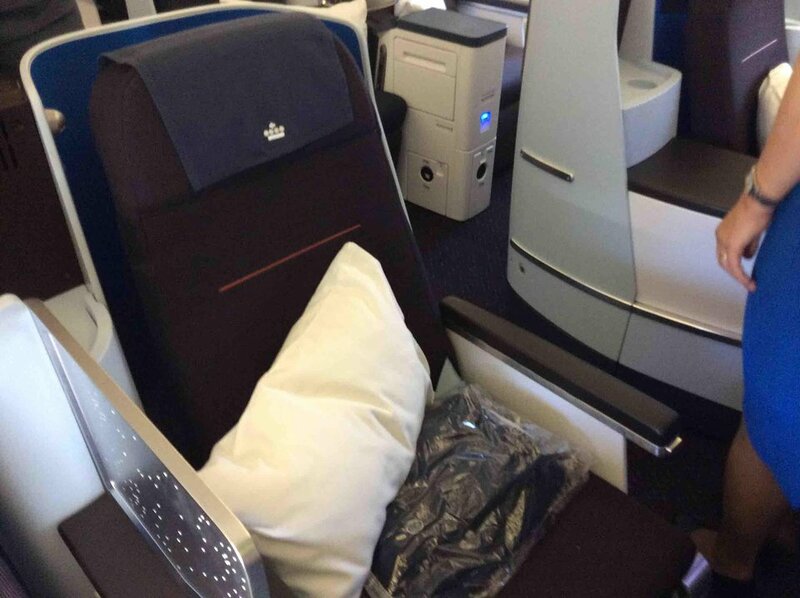 This aircraft features KLM's new Business Class with flat bed seating. This is the newest version of the 747 with 35 seats of World Business Class split between the upper and main cabin, whereas the older versions of the 747 had 42 angle lie flat seats. 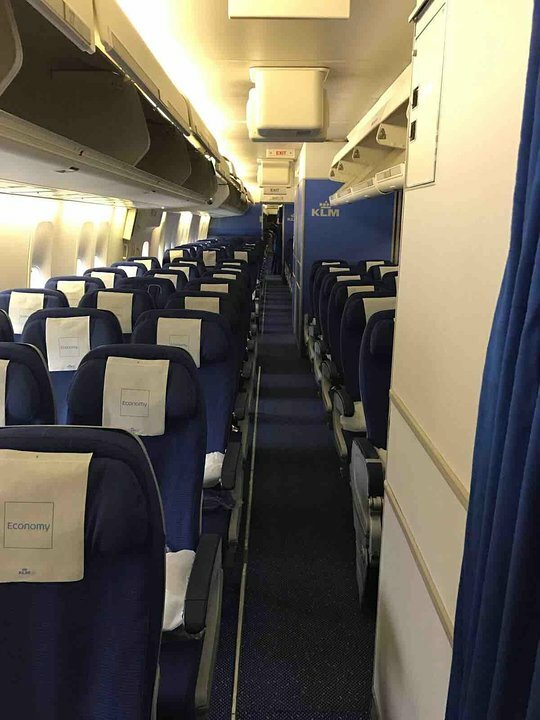 This aircraft features KLM's Economy Comfort seats. These seats are part of the Economy class cabin but feature an extra 4 inches of legroom. These seats are available to Flying Blue Platinum members and passengers flying on full Economy class tickets at no extra cost. Flying Blue Gold and Silver members receive a discount while other passengers will pay an extra fee for access to these seats. This aircraft features KLM's latest personal inflight entertainment. The seat has limited legroom due to the entertainment box under the seat in front and the remote control being inside the armrest meant the screen was constantly on and off. When the seat in front was reclined the screen was very close indeed to my face and this was not helped by the fact that 43C would not recline. All in all a most uncomfortable and very narrow seat. For the extra money, this seat was completely worth the price. I am 5 foot 6 inches tall and sat in B seat after learning about the electronic boxes. My boyfriend (6 foot 3 inches), sat in C and was able to stretch his legs into my area and then I was able to stretch in the area to my left. There was so much room there we were able to put our backpacks from the overhead and have everything within our reach instead of continually getting up and down. At some point during the flight we did end up switching seats and he sat in B and completely stretched his legs into the opening. Seat 77B on the upper deck of this KLM plane was really nice. In fact, I really enjoyed traveling on this upper deck. It felt really spacious and relaxed with a large, open, empty area immediately infront of row 77. While there isn't a full divider between passengers sitting in A & B or J & K, I still felt that I had some privacy. The entertainment centers are positioned in such a way to not be too intrusive for the other person. Note that the bathrooms seemed considerably smaller than on other flights -- but that was only a minor issue. So-so. Not much foot room for a eisle seat. AC, fans blew right on this person but just an older plane. Economy Plus seat by window. Roomy but a little far from window so hard to lean against. Foot space good. Not most comfortable seat on a long flight. Entertainment display is getting old also. Nice that EP is separate section. Very very tight seat for a person of normal weight!! Paid extra for this one. Never experienced this before. Control panel was painfully sticking into my thigh. I had it removed and put it on the floor. But there was still a case wich stuck out of the chair. Legs more then enough room but ofcourse allways people stretching there legs there and stumble over your feet. No charger or USB. Nice crew but very oldfashioned plane. Wouldn't recomend it to anyone: imagene the same crampy seat without room for your legs!! This Seat has only half leg space because of an box under seat 35B. There is no space for a left leg. The seat 36B is bad (may be good for a pirate with only a right leg). Amazing view, both engines lined up nice at the same angle when I looked back. Had two windows and could see a lot of the scenery. Was a great flight and I had lots of leg room. I upgraded my seat because this was my first and probably last time on a 747. Old but great plane! 65 B & C were great for a couple. There is a box in front of b, but husband shared my leg space since there's no divider, so it was fine. Able to store bags on the side in the gap between the wall and seat. Can't lean against the wall, but headrest curls up deeply so that made up for it. Back of plane has lots of space to stand and stretch between toilets and no commotion since no galley in the back. Even with the dated media, we'd fly this plane again for a long haul flight, and KLM has great service and food. Dont waste your money on Economy Comfort seats...you get a better deal for less when you choose the Emergecy Exit seats. Im 64 and i have regretted my decision after i flew to Amsterdam. I had more leg room flying Boeing 787 Dreamliner. I upgraded at check-in and got a really fine seat in Business class. It was roomy and comfortable - a real pleasure! One disappointment, though, and it was quite a surprise. The lavatory was TINY and very cramped. I would have hoped for, and really expected, a toilet with somewhat more room than this. The seat is very comfortable although not as private as previous reviews have suggested. I was very aware of the couple in the row opposite. It is best in bed mode and I had a very pleasant sleep. Under seat in front (11E) is a big metalbox which restrict the space for your feet which makes this seat unrecommended. Seat 21c was approx 14 inches wide. Paid premium Econ. For seat with extra room. Seat appeared to be a jump seat to make room for the aisle. Seat is in the front row so leg room is great BUT seat is very narrow. I'm on the slim side and still was very uncomfortable in this narrow seat. Very little wiggle room and I kept accidentally elbowing the guy next to me. Flew from LAX to AMS June 2017. Seat was great. I really like the flat bed seats. I was able to sleep 4-5 hours with no problem. Service and food were both excellent. IFE seemed OK but between all the meals, sleeping, and reading a book, I didn't really use it. No problem with noise in the upper deck. Almost like flying in a private jet (except when disembarking). This seat is really good since it is very private, and also has a cozy feeling, because you are at the very front of the plane, where the cockpit used to be. This seat is way better then the old business and has way more features. The most notable difference was the IFE response. The food was good and the staff quite polite. I am happy to know that I can fly KLM again now, that it has regained quality. Great seat, recommended! The "B"-seats in rows 63-66 have limited leg-room due to a box with electrical installations which is mounted under the seat in front. I've flown this aircraft many times, I can't agree with the comments, I'm 1m91 (6'3" for those in the country that doesn't use metric) and leg room is fine, whether the seat is wide enough depends on body width I guess. With 85kg I'm pretty average and I have no trouble. For those choosing economy comfort... seat 16A has perfect window post alignment if you like to lean against the post while reclined, 15A has the window next to your head so leaning is more challenging. The far right row in econo + has some room between wall and seat so no leaning. It's comparable to an isle seat. Unfortunately no in seat power, not even USB from the entertainment system. But the purser station has power and if available the crew will charge for you. I've been from SEA to AMS on Delta, AMS to KBP on KLM, KBP to LWO and back on UIA, and repeated the process by heading via SFO. The seat was abysmal, in which I did not have any reclining, so I had zero sleep, but the in flight entertainment was quite good, so that was a plus. I would fly KLM again, but not in this aircraft! An11 hour flight from Amsterdam to LAX was a nightmare! I am an experienced traveler and I have never seen as cramped a seating environment even in economy. I'm 5'2" and there wasn't sufficient leg room for me to feel comfortable. My husband at 6'2" was miserable. The seats were so close I could barely breathe with the tray table down. Nor could I reach my purse on the floor to get my glasses, cell phone, medication, etc. My husband had to get up and stand in the aisle so I could lean over his seat to get my purse. Also the under-structure of the 4 center seats does not line up with the seats but anchors to the floor so that it obstructs foot space of the seats behind. I had to fight an obstruction between my feet for 11 hours. It also made it impossible to store my small computer case at my feet as I usually do. My small purse filled all the space available. This seat is awful. While you do get additional leg room, you have to be tiny to sit here. I am not big by any stretch, but the seat is about 2" narrower than any other seat. 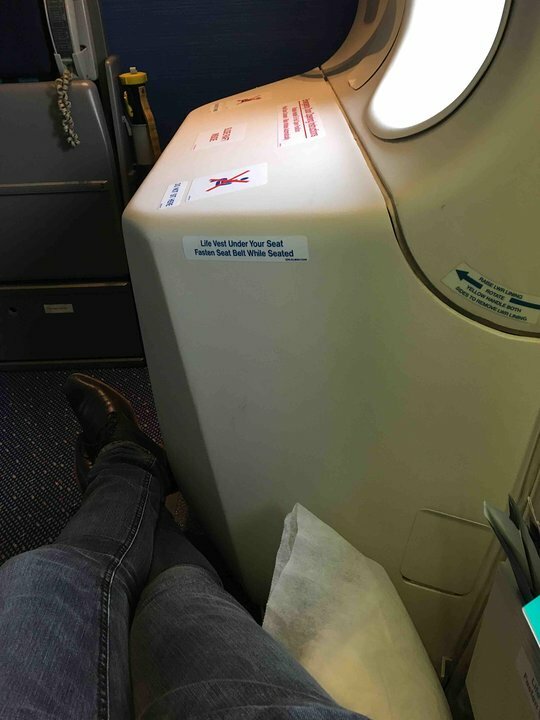 I sat in normal economy on the flight to Holland and was much more comfortable than the seat I paid $100 more to sit in. I still have bruises on my hips from trying to get in and out of that seat. I have never EVER sat in a seat where my legs touched both arm rests. I was crammed into this seat. Once you are in it, don't expect to move. Metal box under seat in front, as for seat 22B. There is blockage under the seat in front, leaving room enough for no more than a small purse. Its maybe 11" wide at the most and does not fit a backpack. Seat 41A was wonderful. I'm 6 ft tall and had plenty of leg and hip room. Flight was comfortable with great service. The plane also had the individual air vents so I was able to find a tempature that worked for me rather than too hot/cold. Look forward to flying this plane again. 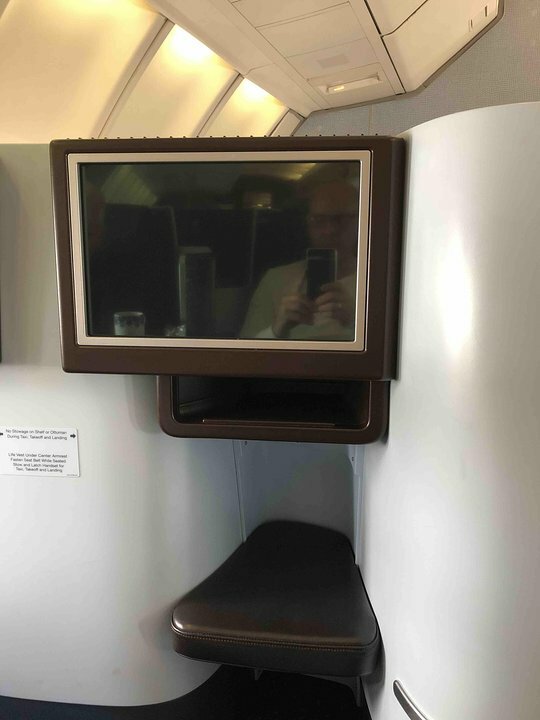 Floor-mounted media box restricts the legroom for seat 12E. As a result, you don't get the extra space you pay for. I believe it was one of the best economy seats. The recline was great, there was noone behind to bother. The lavatories being near didn't bother us at all. The best was that we could stand behind our seats for as long as we wanted, next to the exit door, the room was spacious enough for more than 3-4 persons. Great seat, I would definitely recommend it! worst seat throughout the aircraft. especially during a night flight. Sitting directly to mainkitchen. Making meals during a night flight. Bright light constant on and bumping into you. Coming in and out. Terrible! This seat has very limited floorspace due to a combination of the presence of a mediabox under 11E and seat support, leaving no space to place not even one foot besides the box. I have a photo to illustrate. This seat is incredibly tight. I am 193 cm and not fat (thank God) but this was the narrowest seat I have ever been subjected to. Even budget airlines don't try anything this narrow. Made even worse by IFE controls sticking into my thigh. I was lucky that 21 J was empty but imagine my horror when I heard the purser trying to flog the seat to another disgruntled pax. Thankfully he failed. Legroom was fine, lavatories no problem and I was first in line for any goodies emerging from galley. Food was fine and so were crew but seriously, you need a skinny behind to get anywhere near comfy in this seat and if you have a stranger beside you forget it! Worst flight. Absolutely zero leg room, I'm 6ft 2in. My knees were touching the seat in front of me. AV remote is in seat side so every time I moved I stopped the film or turned on the light. You are right, disturbance from galley, but mostly light as staff not closing curtain. Very private seat, no one between you and the window or aisle. No one will walk by you except the two people across the aisle or perhaps the flight attendant when you are being served. Perhaps the most private seat possible on a commercial airliner. This is a bad seat. This seat has less leg space because the video box is placed under the front seat. So you need to put your legs between the seat and the wall. This is very uncomfortable on a long flight. Pleasurable seat. Even for taller person, i am 6 foot 2, this seat is comfortable when turning into flatbed. Screen quality is not so good. Screen does not tilt. Bed quality is pretty good, especially when compared to deltas 737. These 747s are my favorite airplane. The reconfigured seats are a big improvement, however it should be noted that for all window seats on the lower deck the footwell space is reduced by about 50% due to the curvature of the fuselage. Row 21 seat width are around 17" with a substantial protrusion from the A/V controls. Seat 21a has the gigantic slide from the aircraft door directly in front of it and has absolutely NO legroom. The passenger sitting there must angle their legs in front of seat 21b. 21a should really be removed. Row 21 seats are less than 17"! Further, they have A/V controls that protrude almost 2" further than that! The headphone plug is also low on the inside of the seat which will gouge into the side of your leg. My wife is 5'4" and 60kg and had issues with the seat width. Stay away from this row unless you are a very petit person! 22A is a very recommendable seat, it is near the exit, so you can leave quickly after the landing. An other advantage is the low proximity to the galley where the crew prepares a little "bar" for the passengers with dutch cheese and crackers. 22B and 22C have a limited legroom because of steel boxes under 21B and C.
22A is a very recommendable seat, it is near the exit, so you can leave quickly. An other advantage is the low proximity to the galley where the crew prepares a little "bar" for the passengers with dutch cheese and crackers. 22B and 22C have a limited legroom because of steel boxes under 21B and C.
This seat is a tiny little seat squeezed into the corner of the airplane, hardly any space for hand luggage, small legroom which is edgy and no way to turn around. It's hard even to get in and out of this seat. The flat seat is a big step forward. The upper deck lost the additional storage next to the seat. Contrary to the old seats, the emergency exit window-seat has no direct access anymore; you have to climb over your neighbour in case he/she is asleep. The IFE screen is fixed and can not be adjusted, as was previously the case. In the New World Business class config, the aisle seats where there is a seat in front, have a tapered foot well, reducing the space. The window seats have more room for your feet, as do those with no seats in front. The additional storage space next to the windows has gone in the New WBC format. Seat is a big improvement over old business class. A bit narrower, but full flat bed. Unfortunately the entertainment system in 73b was defect, but i could move to 72b, which was ok. KLM no longer provides noice cancelling head phones, but normal ones. KLM flies 1 versions of Boeing 747-400.